Look at the size of that calf! Mothers Day is coming up and there’s still time to send your mom a copy of U.S. Highway 89: the Scenic Route to Seven Western National Parks via priority mail, discounted to $24.95 for blog readers and Facebook fans. Priority mail takes 2-3 days from Salt Lake City to almost anywhere in the U.S. Give Mom an armchair tour of the greatest places in the western U.S., or invite her to pick a destination from the book for a future family trip. Personalized dedications are my pleasure, just let me know what you would like inscribed with my signature. I hadn’t been out to Antelope Island since Millie’s pig-roast in 2006. This weekend I went out twice, once on Friday to scout with Scott Smith, and again with Bryan Jones for Saturday’s sunrise and the actual photowalk. Thirty-plus photographers showed up for PhotowalkUtah’s fifteenth event at Antelope Island on Saturday. 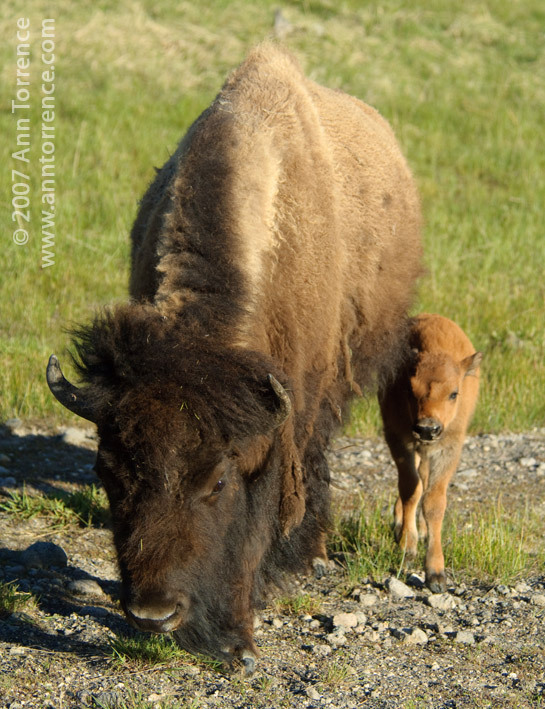 Scott did a great job organizing this month’s trip to observe the working of the captive herd of bison. Working means injecting, ear-tagging, micro-chipping, pregnancy testing, culling, and other -ings, none of which fit in with the bison’s desires for the day. 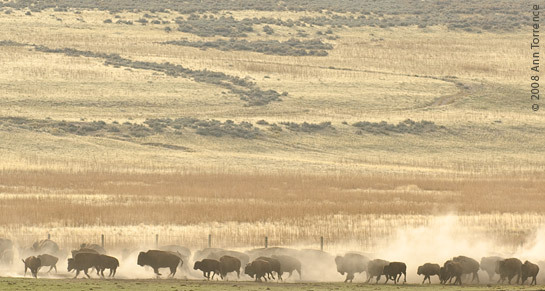 A managed herd of about 700 bison roam the island in the middle of the Great Salt Lake. Each fall the state parks employees round them up, using horses, vehicles and the occasional helicopter. After resting a week in holding pens, a large group of volunteers and staff give medical check-ups to nearly all the bison; a few old mean bulls are left out on the range. A couple hundred are culled for auction to get the herd back down to the carrying capacity of the island. The operation is a mix of time-honored skill and new technology. The animals are herded into the first chute with beat-up SUVs, and then flagged on buy a line of men ready to jump the panels. Micro-chips are read with a wand and the operators wear wireless head-sets to communicate with the folks in the office updating the database. One person grabs a little calf’s horns to keep it from thrashing around, full-sized units get temporary nose-clip roped to a strong cleat. The herd manager rebuilt stronger chutes this year, for the safety of the animals and the workers, but Scott and I still saw a bison jump a fence. The main group arrived around 10 am, we made our group photo and hung out at the pens for a while. Mostly I had a great gabfest, since I shot so much on Friday. Others went on to an old ranch on the island and are contributing some interesting images on that subject to our Flicker pool. It was great to see Tom again, meet his son Zach, and to get to spend some time with newcomers Chris, Mark and Megan. There will be at least two more Photowalks in 2008, and we have some exciting plans for 2009. You can subscribe to PhotowalkingUtah’s RSS feed at our spanking new website. Simple, fun, free: that’s PhotowalkingUtah. Hope to see you out there soon. 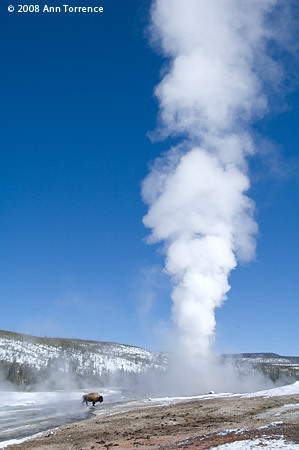 Right on cue, this bison ambled in front of Old Faithful on Tuesday.